Hi, Thank you, friends and viewers. Today I will post how to make veg Manchurian recipe. 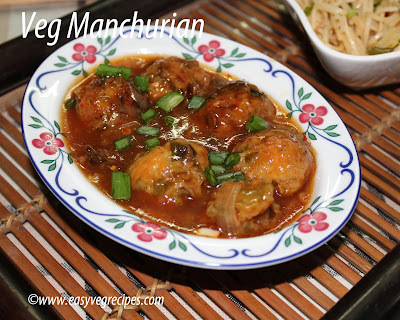 Veg Manchurian is the most fascinating dish for kids. Of course, Indo-Chinese vegetarian recipes always attracts kids. They are very easy to when we have all the necessary vegetables available. Though we need to have a lot of patience to chop or grate them. Make small dumplings with veggies, fry them in hot oil. Cook them in sauces and serve them immediately. Juicy inside and crispy outside veg dumplings accompanies best with Veg Fried Rice, Hakka Noodles, or just have it as an evening snack item. Serve the Indo-Chines recipes as a side dish to rice, roti or even serve them as an evening snack. 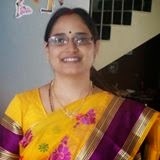 I have picked the recipe from different cookbooks and websites. In a wide bowl mix all the chopped and grated veggies. Add salt and also all other ingredients listed under 'Ingredients for Dumplings", except oil. Mix them well, do not add any water. This will turn into a moist dough. Make small lemon size balls with the dough. Heat oil in a kadai, slowly drop each dumpling into the hot oil. Fry them in low medium flame till they turn into light golden brown. Keep them on a kitchen napkin aside. We can store these dumplings for further use also, kids like them very much. Heat oil in another kadai, add chopped ginger and garlic. Add chopped spring onion whites, fry them till they turn soft. Add soy sauce, tomato sauce and red chilli sauce. Give a nice saute. Then add water or vegetable stock. Check salt and add it if necessary. Add the above fried veg dumplings, allow them to boil in the sauce for 2 minutes. Add water to corn flour and mix well to avoid lumps. Add this slurry to the above sauce to get it thicken. Transfer it into a serving bowl, temper it with some chopped spring onion greens. Serve hot, spicy veg manchurian with Hakka Noodles or Veg Fried Rice.